Summer is finally here, and that can only mean one thing: it’s time to spruce up your outdoor living spaces! 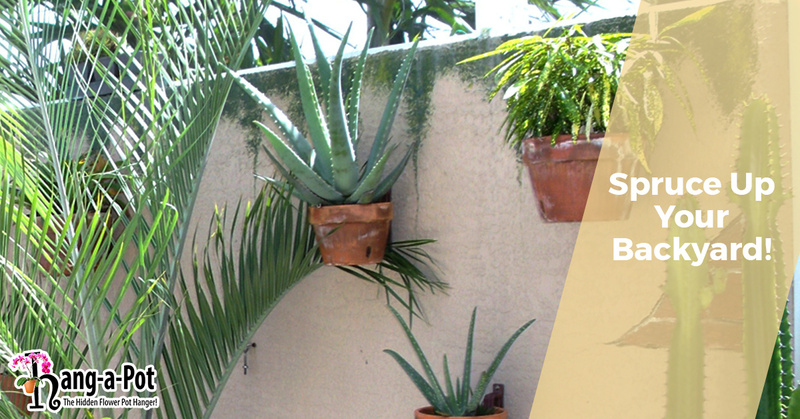 There’s nothing more enjoyable than spending time in your backyard with family and friends, and when you purchase Hang-A-Pot flower pot hangers, your outdoor arrangements are sure to be a topic of conversation. 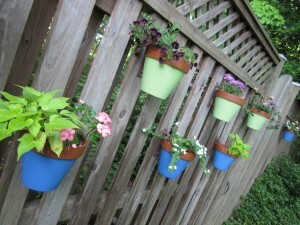 Check out these easy decorating ideas and be sure to pick up your package of plant hangers today! Transform your boring, wooden privacy fence into a piece of art by hanging beautiful greenery and flowers on it! Whether you have a wood, vinyl, or wrought iron fence, Hang-A-Pot hooks are easy to install, providing an outdoor decorating solution that’s simple and fast. Not sure what’s possible with Hang-A-Pot and a fence? Browse through some customer photos and decorating ideas! No matter what design you choose, you can be sure that our hooks will inconspicuously make it possible! Are you longing for a bright and colorful backyard but don’t have a patio or deck on which to display potted flowers and plants? If you’ve got a tree in your yard, all you need is Hang-A-Pot flower pot hangers to create a gorgeous, vertical flower display! Paint ceramic pots with bright colors for an eclectic and funky look, or leave the original terra cotta finish as it is for a more classic, natural appearance. The options are endless! Often referred to as “upcycling,” recycling old items and turning them into unique pieces of decor is a hot trend right now. With our innovative pot hangers and an old pallet, you can create a fun focal piece to complement your outdoor living spaces. Pallets are easy to paint or stain and simple to prop or hang, providing the perfect foundation for a backyard masterpiece! Check out some amazing designs here! 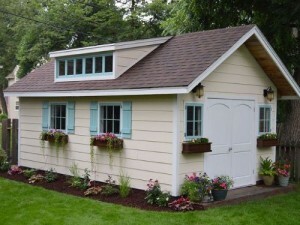 No one likes to have an outdoor shed that creates an eyesore for visitors. If your shed has windows, use a few of our plant hangers and a long rectangular planter beneath them to create a window box effect. To give your shed a welcoming appearance that matches that of your home, try mounting smaller pots on either side of the door for a beautiful sconce-like effect. No matter what material your shed is made from, Hang-A-Pot can be easily affixed to the exterior walls to transform an eyesore into a beautiful addition to your yard. Want to learn more about Hang-A-Pot and how it works? Contact our friendly staff today! We’ll gladly address any questions or concerns you have. Otherwise, be sure to check out our wide variety of flower pot hangers and plant stands and order yours to enjoy free shipping today!